One of things I look for when following a blog is consistency in their posting. Austin posts multiple times a week with solid content. He also shares the wealth by providing you with a list of recommended blogs. While I don’t read blogs everyday, I do every week. It’s easy to get bogged down in the daily grind, so having great blogs to help you stay up on what’s going on are much appreciated. 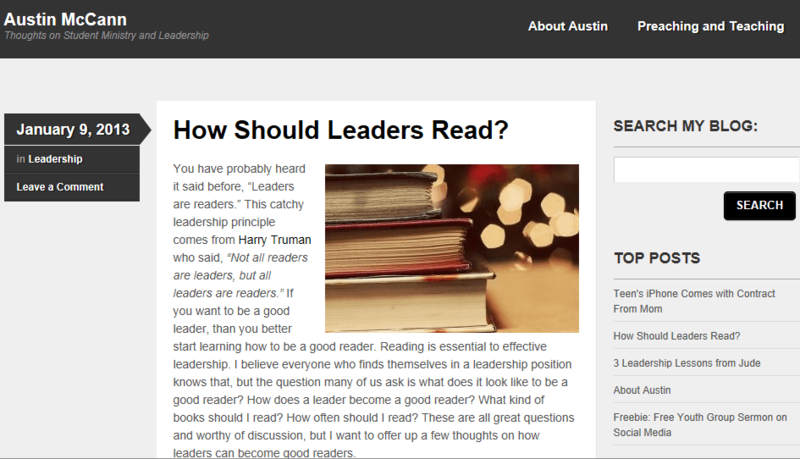 Take a few minutes today to stop by Austin’s blog, I guarantee you’ll find some helpful resources for you and your student ministry! Austin is the student ministries director at Christ Community Chapel-Stow Campus in Stow, OH. He has a BA from Piedmont International University in Christian Ministries with a student ministries focus. He is currently working on his Master’s with Liberty Baptist Theological Seminary. Austin enjoys reading, writing, playing basketball and golf, spending time with his wife, and sharing the Gospel with students and helping them live a Bible centered life.